The Bestiary is a gorgeous book about very strange things. It's illustrated with many surreal creatures, the pages are tinted like old paper, and the tales within are a mix of short stories, collections of first hand accounts, reports, scientific-style papers, and folklore—all about the strangest creatures that never existed. There's one for each letter of the alphabet, including a symbol and an invisible letter, and no two are alike, but they're all unified by the sheer, spooky, strangeness of the whole. Most of the stories are about creatures that live where people are but go unnoticed, or creatures who are created by what people do, and this human connection both grounds the stories and makes them even more creepy. The book is never quite fully scary, it's not a book of horror stories, but there's a feeling that's pervasive through the whole volume that at least some of this could be real. That things actually do happen like this, even if the details are too strange for reality. 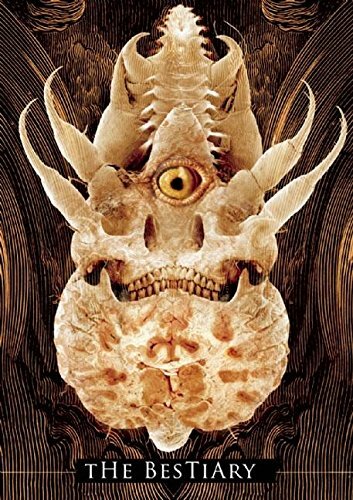 The Bestiary does that thing that good weird fiction should: It makes you question, just a little, the limits of your own perceived reality. There's a charming old-fashioned-ness about a lot of the stories and the book itself, as if The Bestiary is being rediscovered even as it tries to bring back the idea of bestiaries as a literary form. There's a history of them in the beginning that claims they're a natural occurrence of the world more than something written by people, and that, too, is in line with the delightful strangeness of the book. Some of the stories share a quirky sense of science and history with Steampunk tales, the form the editors are most known for collecting, but they're not bound to any one genre. Organized by letter rather than by theme, the stories skip from serious to jaunty, from existential to natural-history report, from grounded in our world to placed entirely in fictional lands, playing with the conventions of academic work as much as narrating. There are sketches, graphs, a few weird photographs. The author bios at the ends of the stories charmingly treat the writers as if they, too, are weird unknown creatures. There's a glossy cover and a red in-binding bookmark, as if this really is the important tome in cryptozoology it claims to be—which is brilliant, because that detail, too, blurs the edges between life and fiction and allows the suspension of disbelief that's needed for the strangest of stories. The Bestiary is not a large book, but it's an experience. There's a lot to savor while reading through it. It's an aesthetic feast as well as a collection of words, and it's obviously designed to be more than just a book like any other, read and then discarded. It's pretty. It's bizarre. It's unusual and unique. It lingers in your mind after you've read it. Maybe it makes some of the untrue creatures inside a little realer from the act of being read.